Dr. Kruti N. Rajvik, Ph.D.
Dr. Birva N. Raiya, Ph.D. The division is facilitated with Automated Ventana Immunostainers for immunohistochemistry work, BD FACS Canto II eight colour Flow Cytometer for flow cytometry work and Eppendorf Thermal Cycler for molecular biology work. The division evaluates 72 immunohistochemical markers for differential histopathological diagnosis, and predictive markers such as ER, PR and Her-2-neu in breast cancer. By Flow cytometry 46 markers are being evaluated for immunophenotyping of acute leukemia / CLPDs, and for PNH and CD34 evaluation. 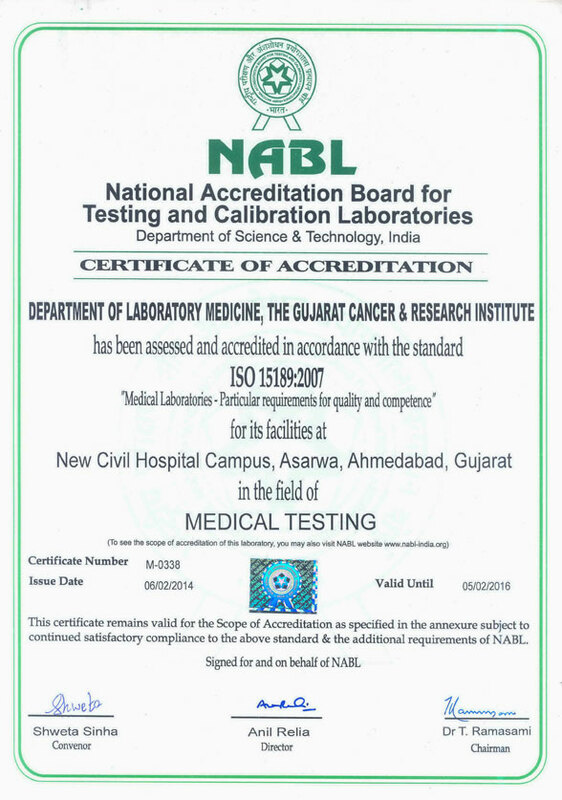 Cancer Biology department started MSc Cancer Biology in affiliation to Gujarat University in July 2014. The division participates in teaching of MSc Cancer Biology and enrolls PhD students. Post-graduates ( MSc / Mpharm ) from various universities of Gujarat enrolled for dissertation work and MSc and MDS students as observers.. The main areas of research include study of PI3KAKT pathway, and EMT pathway in breast cancer. Moreover, evaluation of circulating tumor cells and cancer stem cells are evaluated by Flow Cytometry in breast cancer patients. Further, a project is proposed on molecules that influence cancer stem cell niche in breast cancer. Minimal Residual Disease is evaluated by flow cytometry and using molecular markers in B-ALL. EGFR downstream signaling pathway in non-smoker adenocarcinoma of lung and immune dysfunction in oral cancer are also being studied. Based on above research areas 7 research projects are ongoing in our division.